Seasickness is a real disaster which can ruin you well planned and long-awaited sailing holidays. There are so many advices how to behave and what to do or not to do in order to avoid seasickness but I think that seasickness has to be approached personally. Pharmaceutical industry does a pretty good business producing all sorts of drugs against seasickness while those who do not like pills and ‘chemistry’ (like me) prefer useful wrist bands. However, all mentioned could be helpful if you really believe it would help. 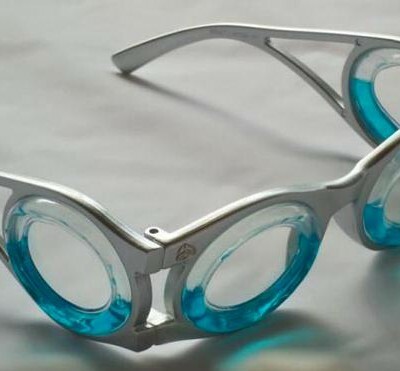 Few days ago I noticed that seasickness glasses were produced and tested by seafarers. First of all, they look so silly that if they don’t help you with seasickness they would help your mates laugh every time they look at you. The frame of these glasses contains liquid which recreates the natural horizon, enabling the eyes to transmit the same information as your inner ear. The concept seems pretty smart because it is believed that the cause of seasickness is the sensory conflict between what the inner ear sends versus what the eyes send to our brains. The glasses are to be worn for few minutes as soon as you feel the symptoms. I am sure that only one pair of those glasses would be enough onboard because they look so funny that other teammates would forget about seasickness as soon as they look at the person who wears them. The manual says that there are neither side-effects nor contra-indications to the person who wears seasickness glasses but laughter onboard would be appreciated as harmless side-effect for the other crew members. However, this device against seasickness comes with the wrist band, which I found usefull, because it is not about taking pills and waiting for the effect. Statistics say that they are 95% successful while not one pair was returned to the manufacturer due to malfunction. However, I still believe that seasickness would be the best fought against by preventing it – actively involvement in sailing and observing the horizon in heading direction.